Think of emerging chains as the canaries in the restaurant coal mine: Ignore the ones that croak and pay attention to the ones that fly. What are they doing to succeed? Here are four achievers to watch within the systemwide sales range of $25 million to $50 million, as selected by the emerging-concept editors at Restaurant Business along with Darren Tristano, chief insights officer for Technomic. These standouts—three fast casuals and one full-service operation—were chosen as the 2017 Emerging Chains of the Year on the basis of their year-over-year sales and unit growth, as well as their commitments to technology, social giveback, and quality of food and service. Their success strategies will be aired during next month’s Restaurant Trends & Directions conference in Chicago. Top executives from the winning chains, as well from many other emerging brands, will gather at Restaurant Trends & Directions to discuss growth strategies, menu, marketing, workforce issues and more. "These stand-out emerging concepts strongly represent current consumer appeal and are good indicators for short-term sector success," Tristano says. "They should be commended for their innovations in technology, menu and hospitality. Other operators would be smart to pay attention to their business moves in coming years to evaluate whether these innovations can be incorporated into their operations." 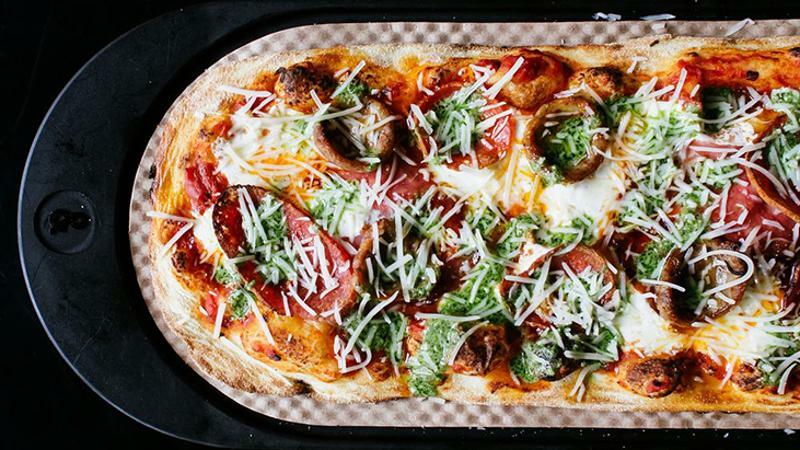 πzza, a Washington, D.C.-based fast-casual pizza concept that posted 69.5% sales growth in the past year and added seven new units. Besides being known for long, skinny, customizable pizzas (cooked in 90 seconds in a conveyer oven), πzza has built a progressive social mission. The brand’s founders are outspoken in support of the $15 minimum wage for its staff, known company-wide as “the tribe.” The chain’s core values are: Make it personal. Elevate everything. Keep it fresh. Celebrate oneness. Bubba’s 33, an Indiana-based, family-friendly sports bar from Texas Roadhouse, which sees the spinoff as a new growth vehicle. The brand’s focus is on Southern hospitality, with an emphasis on housemade ingredients, from burger buns to onion rings to a customized burger blend that includes 33% ground bacon. The chain offers three seating areas at each unit—at tables, at the bar, and outside—all with TV views. Bubba's saw sales growth of 133.7% in the last year, while more than doubling its units from seven to 16. Cowboy Chicken, a Texas-based rotisserie chicken chain poised for growth. The fast casual posted sales growth of 39.8% and total unit growth of six in the last year, driven in part by a new order-and-pay app. The signature chicken, served with Tex-Mex fare, is broiled over an open fire, visible to customers through the open-kitchen design. The Halal Guys, a concept that started as a lone New York City food cart. After quickly changing the menu to a simple selection of hearty Middle Eastern food, the brand has taken off, adding more than 30 units in the last year and posting sales growth of a whopping 740%. The brand keeps things simple, serving up large portions of meat, rice, falafel, hummus and a craveable “white sauce” that fit halal dietary standards. The Restaurant Trends & Directions conference brings the top executives from successful emerging chains together for three days of menu development, performance discussions and, most importantly, peer-to-peer networking. Armed with Technomic research, attendees of Restaurant Trends & Directions are better prepared to tackle challenges, leverage relationships and refine marketing plans.